Just days after reports that the Food and Drug Administration is planning to propose further restrictions on the sale of e-cigarettes, the maker of Juul announced Tuesday it is taking steps to curtail the use of its flavored products by teens. 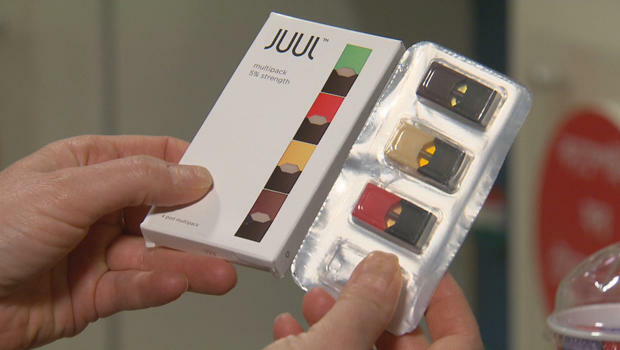 Juul Labs said it will stop selling its flavored pods — mango, cucumber, creme and fruit — at more than 90,000 retail stores nationwide, including convenience stores and specialty vape shops. The company is also shutting down some of its social media accounts, which are popular with young people. In a statement, Juul CEO Kevin Burns said the company and the FDA "share a common goal – preventing youth from initiating on nicotine." "We don't want anyone who doesn't smoke, or already use nicotine, to use Juul products. We certainly don't want youth using the product," he said. "It is bad for public health, and it is bad for our mission." In September, the FDA set a 60-day deadline for several major e-cigarette companies to prove they could keep their products away from kids. Juul holds more than 70 percent of the e-cigarette market share overall and is known for its popularity among minors. The device resembles a flash drive and can be plugged into a computer to recharge. Flavored nicotine products are especially concerning, experts say, because their taste appeals to young people, thus making it more likely they will start using the products and get hooked. Juul said the four flavors will still be available for sale online at the company's website, but it will impose additional age-verification measures and third-party verification to block sales to anyone under the age of 21. Regular tobacco, menthol and mint flavored pods will continue to be available at retail stores. Mothers like Meredith Berkman, with Parents Against Vaping E-Cigarettes, told CBS News' Anna Werner there should be a ban. "We just want them to ban the flavors, because the evidence shows that flavors hook kids," Berkman said. The company will also eliminate its U.S.-based social media accounts on Facebook and Instagram. It says it will limit its presence on Twitter to non-promotional communications and utilize YouTube for posting testimonials of former adult smokers who have switched to Juul. The company says it has never used Snapchat. Last month, researchers from the Keck School of Medicine at the University of Southern California raised concerns about adolescents being exposed to Juul through social media. Their study found that underage kids make up 25 percent of Juul's followers on Twitter. "Juul's posts go out to its followers, those users then retweet into their own accounts, and the message gets propagated within the social network, ultimately reaching a lot of adolescents accounts in a small time period," study author Dr. Jon-Patrick Allem told CBS News in October. Juul said it has already imposed 21+ "age-gating" restrictions for users to access its Twitter and YouTube content. The company said it will continue to monitor and remove inappropriate material from third-party social media accounts. The FDA is expected to announce a proposal this week to ban the sale of most flavored e-cigarettes at retail stores and gas stations across the country. The agency is also expected to propose banning menthol in traditional cigarettes.